When do we get barley wine beer? Luckily, barleywine season is upon us! If all goes according to schedule you should be sipping a Great Basin barleywine in the next couple of months. 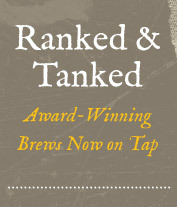 You can keep checking our website for the newest brews on tap at our breweries also. Limited custom run of 40 pair. The Night Train takes rocker/camber theory beyond its all-mountain, one-ski-quiver origins, creating a pure powder ski that’s still capable in-bounds. Its progressive Twin Rocker profile and early taper dimensions allow you to push the envelope further in steep, deep terrain than you ever thought possible, while vertical sidewalls grip sketchy traverses and sidecut lets you carve up hardpack. dondo@greatbasinbrewingco.com or visit our Sparks brewery. Now through February 6, 2013, every Wednesday is "ICKY Wednesday." Brewery patrons will receive a single entry for every pint of ICKY purchased on Wednesday. The drawing for the skis will be held and winners announced at our Reno brewery on Wednesday, February 6, 2013 at 6:30pm. Winners must be present to win. The skis are lively and super light, so you can ski them all day and enjoy that well-deserved Great Basin ICKY IPA after the last run of the day! Pick up a bottle, or two, and make some for your sweetheart! Makes a great Valentine’s Day breakfast for beer lovers, pancake lovers and lovers of life. Our bottled brews have escaped across the state line! We’ve had confirmed sightings in Lassen and Plumas counties, and they seem to be on the move. Hoping they’ll migrate over to your area? Ask for Great Basin beer in your local stores! End your day the Great Basin way! Our award-winning brews are available at Taps & Tanks – our newest taproom location and largest production facility on E. McCarran between Rock and Mira Loma.